In the first part of the Falls of Havasupai, I talked about Little Navajo, Fifty Foot and the famous Havasu Falls. 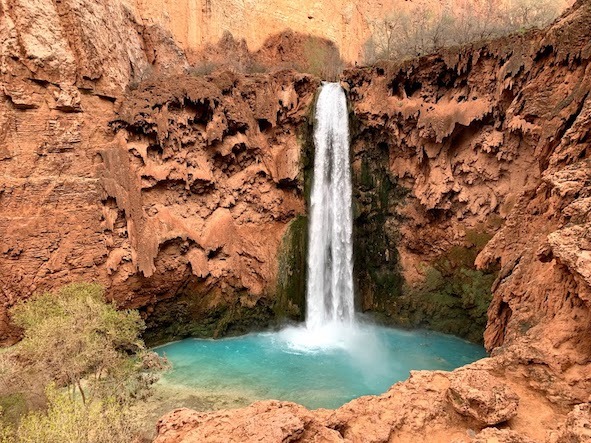 In part two of this post, I'm going to talk about Mooney Falls and Beaver Falls. My god, what an adventure. The one place where you can a high adrenaline rush in Havasupai is the descent to Mooney Falls. As long as you proceed with caution, you'll come out with an exhilarating experience! The first thing about Mooney is that it's right next to the end of the campground. We just started on our hike, and immediately came across Mooney Falls. We were like - Oh, it's right here! There's a beautiful view of the entire falls right at the top, complete with a bench, so you can choose to not get down. But what's travel without getting out of your comfort zone? So we started our descent down and immediately came across the "Descend at your own risk" sign. We proceeded slowly and steadily, the path was not one for the faint-hearted. We first had to pass through two caves. Following that, we had to hold on to chains and ropes all while balancing ourselves on red rocky sandstone which gets wet and slippery at the end because of the waterfall mist. There's also a ladder at the end. The good thing is, it's not very long. I think it took us less than 15 minutes for the entire descent. But make sure you take your time and proceed at your own pace. The view at the base of the falls was worth the descent. Mooney Falls are the tallest waterfalls in Havasupai, and they're taller than Statue of Liberty for comparison. This single drop waterfall creates a gorgeous blue pool at the base, where you can choose to get a dip. A better place to get a dip would be slightly to the left of these falls, where there are pool-like areas, and also a rope for jumping into the pools. There are a couple of benches at the base of the falls, so you can pack a sandwich or just relax looking at the gorgeous Mooney. Mooney Falls almost sees no sun, so it feels darker and more closed off than Havasu, but it has it's own appeal. Fewer people make it to the bottom of Mooney falls, so it's less crowded than Havasu. The most unique of all falls in Havasupai were the Beaver Falls. Firstly, you need to cross three water streams, and hike approx. 3 miles one-way from Mooney Falls to get to Beaver Falls. There are some ladders and chains present in some areas, but nothing strenuous. Most of the hike you're walking next to the blue-colored water of Havasu creek, in the midst of brick red canyons, which made me want to pinch myself to make sure it was real. You'll also come across a palm tree during the hike. Seriously, you'll never see a landscape like this again, make the most of it! When you start seeing large pool-like formations, that's when you know you've arrived at Beaver Falls. The cool thing about Beaver is that the falls looks different from different view-points. From the top, it looks like large blue pools, and from the very bottom, it looks like a continuous cascading waterfall, and when you climb up a bit, you'll notice that each part of the cascading waterfall is a beautiful fall in itself -- especially the top two. Really stunning and very unique! Since Beaver Falls is the furthest of all falls -- it sees the least crowd, but since the falls themselves are smaller and layered, it may look packed. We came across a lot of younger crowd at this place, because there are some diving spots here. If you do choose to dive, make sure to test the depth of the water before-hand. If you continue to move past Beaver you'll see a large blue pool, and few more cascading falls. After you pass this, you're officially on the route to Confluence, which is the intersection of the Havasu creek and the Colorado river, should you be interested in checking that out. We opted to not go to Confluence, so we headed back to Mooney and the campground after our time at Beaver. So that's all the waterfalls in Havasupai -- an exceptionally beautiful place well-worth the visit! What are the most beautiful waterfalls you've seen? Why did you like them?